Registration is first come, first served. A nonrefundable deposit is required (see below). NOW IS THE TIME TO REGISTER! Camp fills up quickly. 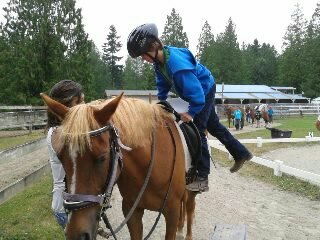 Camps consist of lots of horse time, both riding and on the ground exercises. Daily snacks, crafts, and play time with our other farm animals also included. On the last day of camp, families are invited to attend a show put on by the campers to demonstrate what they learned throughout the week. An appreciation BBQ follows the show, and the kids receive their certificates of completion.